Mumford & Sons are the platinum selling English folk rock band that has taken the US by storm. 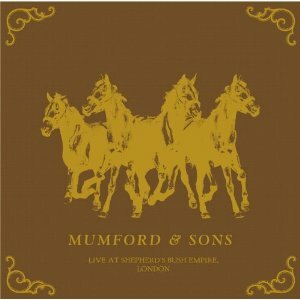 The band consists of Marcus Mumford (vocals, guitar, drums, mandolin), Ben Lovett (vocals, keyboards, accordion, drums), 'Country' Winston Marshall (vocals, banjo, dobro), and Ted Dwane (vocals, string bass, drums, guitar). The band formed in October 2007, rising out of what some in the media labeled the 'West London folk scene' and have since become the biggest break-out alternative rock band in recent history. Their debut album, Sigh No More, was released in February 2010 in the United States on Glassnote Records to critical acclaim from publications such as The New York Times, RoIling Stone, SPIN Magazine, The LA Times and countless more. Sigh No More entered the Billboard Heatseekers Album chart at an impressive #2 in its first week and continued to climb the Billboard Top 200 where it peaked at #2 after a breathtaking performance at the 2011 GRAM MY Awards with Bob Dylan. The band was nominated for 2 GRAMMY Awards for Best Rock Song with "Little Lion Man" and Best New Artist. SIGH NO MORE has since become a mainstay on the Billboard and iTunes Charts where it has become the #2 best selling digital album ever, spawning multi-platinum hits 'Little Lion Man', 'The Cave,' and 'Roll Away Your Stone'. Mumford & Sons also won the ARIA Music Award for Most Popular International Artist in 2010, and the Brit Award in 2011 for Best British Album.